HexCorp is an LA-based product design consulting firm that helps entrepreneurs build great products. They’ve even got their own makerspace! HexCorp recently tested out Cayenne’s new drag-and-drop Arduino integration (very exciting stuff!). I spoke to Mike Hexter, the founder, about his thoughts on Cayenne and what tips he has for emerging tech entrepreneurs. For those who aren’t aware of Cayenne and what it can do, I spoke with Benny Estes from myDevices (the company that created Cayenne) all about their solution and what it can do a few months back. 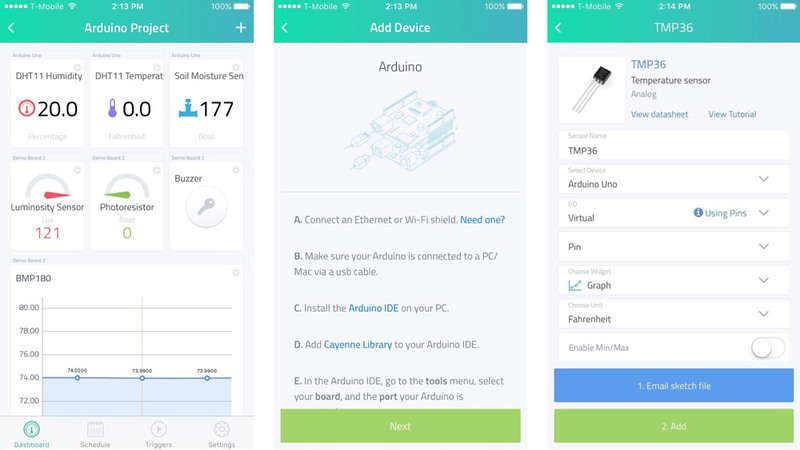 Overall, it is a great tool for building Internet of Things prototypes quickly and easily. Originally, it only worked with the Raspberry Pi, however, they’ve just recently announced a partnership with Arduino and provide drag-and-drop functionality to that platform now too! It is this functionality which HexCorp ran a bunch of tests on to try it out! Spoiler — they were pretty impressed. Mike Hexter and the companies who’ve partnered together! Tell us a bit about HexCorp and what sort of work you do with companies like myDevices. HexCorp is a product design and prototyping facility that helps companies and entrepreneurs to design, prototype and even manufacture their products. Starting a new business or launching a new product can be daunting and HexCorp was established in 2001 to help guide others through the process as efficiently and cost effectively by educating them about all of the steps involved to take on these challenges themselves. We can also offer services to assist in all the areas entrepreneurs might need. HexCorp works with companies like myDevices by exploring and testing the solutions they offer. If we find great benefits then we put those solutions into practice for development and rapid prototyping, which is the case with the Cayenne platform! Can you tell us about Cayenne’s new Arduino functionality you tested out? Cayenne has been used by tens of thousands of people since its exciting launch earlier this year. This has allowed for quick development and rapid deployment using the Raspberry Pi platform. Now that they have added Arduino to the platform, things just got a lot more exciting. Companies and hobbyists alike have been wanting the cross-platform ability to increase their capabilities on such an intuitive platform and now it is here. What sort of tests do you run on a platform like this and how did Cayenne do? We set up an Arduino with a temperature sensor and Wi-Fi shield to control a relay which would trigger an LED light bulb remotely using the Cayenne app. We decided to use the app to control the LED light bulb using a relay switch, as this relay can easily be used for other electrical devices as well. We found it very reliable and did not have any issues operating the app or the Arduino system. Notifications were sent correctly — which can be just as critical as the operation the Arduino is performing! All aspects of the Cayenne system worked seamlessly together based on the rules we set up using the graphic drag-and-drop interface without us having to stare at lines of code. What sorts of developers would you say Cayenne is best suited to after seeing the results? The Cayenne platform is absolutely amazing for beginner and intermediate users. Advanced users also benefit greatly from the platform and the library of compatible sensors is continually growing along with the needs of the expanding user base and community. With some of the upcoming features including an open API and the ability to further customize some code to meet their projects demands Cayenne is quickly becoming the go-to solution for developers of all types. Do you have any tips for IoT developers in general from your experience in consulting in the IoT? Ensure you stay up to date with platforms and their capabilities like Cayenne and get your feet wet to ensure you are aware of the capabilities. A project that used to take days can now be completed in hours using tools like Cayenne, not to mention the value added benefits that you may not have even thought to add to your project. Iterating also becomes much faster when you are using an intuitive platform. What are some common mistakes you’ve seen IoT companies make? Prototyping is necessary before commercialization. Step by step testing and improvements are critical before spending a fortune on unproven IoT solutions. Save time and money by doing it right the first time and be aware that extra time spent in the testing stages can result in massive savings and more importantly — you can avoid costly delays. If emerging tech companies out there are looking for product design consulting work, what should they look for in a consulting firm? This is a hard one to answer and I feel biased. I would just say to educate yourself, be aware that the cost can range a ‘huge’ amount (i.e. a 10k-30K gig for a small company would cost $50k-150k if you have the same project completed by a very large company). Timelines are critical so ensure that whatever team you work with has the capabilities and is not just taking on work (and then going to delay). Have a few ‘discovery’ meetings before starting to do your best to uncover any unknowns through discussion and planning. There are often elements / items / features that pop up that could have been accounted for earlier on to save time / cost / improve the product. Make sure you are open with your team about your end goals as far as sticking to the basics (we want to stick to the most cost effective budget we can) versus taking the time to research and discuss possible additions that could add value to the product (and/or save a lot of time/cost if added now instead of later). Changes made mid-development can have massive impacts on timelines and costs (redoing of work). Give us a quick rundown on the HexLab Makerspace you run? 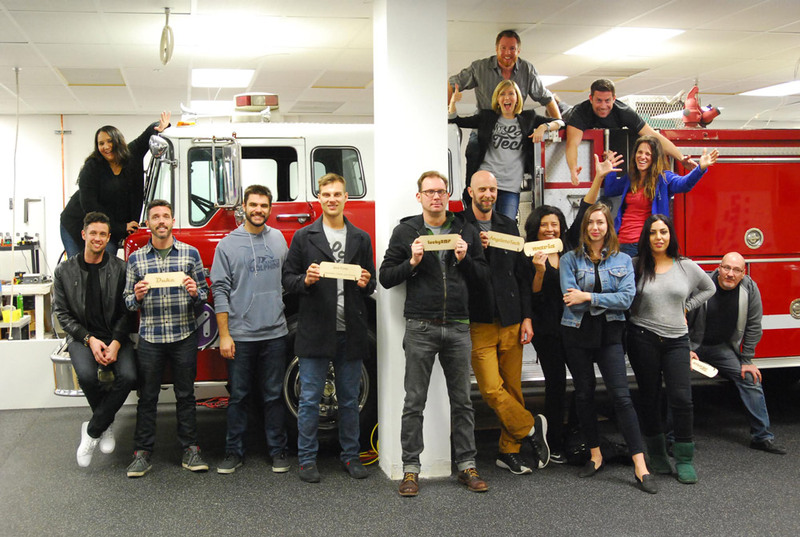 A group photo after a HexLab makerspace class on making name plaques! I would suggest that anyone interested should immediately check the powerful but easy to use Cayenne platform, there are step by step tutorials for beginners that MyDevices have put together along more added by the quickly growing user base. Thank you to Mike for chatting about his experience with the new Cayenne Arduino integration and for leaving us some good tips on finding IoT product consultants! 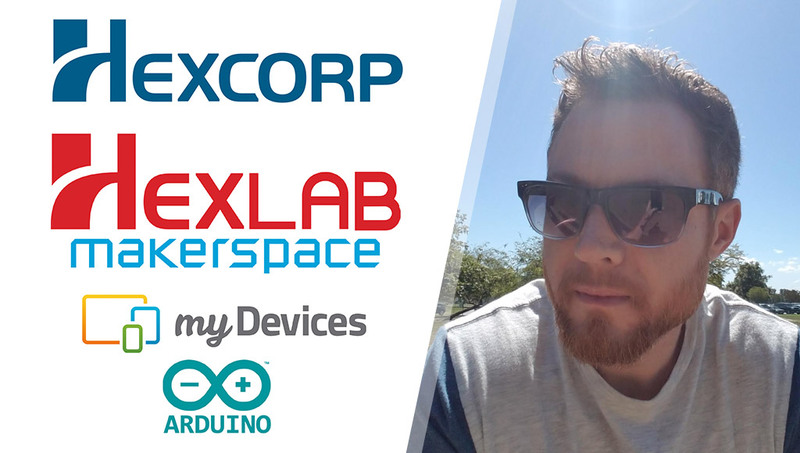 You can find out more about HexCorp at their website and can check out what all the fuss is about in the newly Arduino-enabled world of Cayenne over at the Cayenne website!